Brothers is an upcoming Bollywood action drama film which is directed by Karan Malhotra.This film is the remake of 2011 English Movie Warrior.Brothers stars Akshay Kumar,Sidharth Malhotra and Jacqueline Fernandez in the lead roles.Jackie Shroff will be playing an pivotal role in the movie. Kareena Kapoor Khan is doing an item number in the movie titled "Merry Mary" along with Siddharth Malhotra which is choreographed by ace choreographer Ganesh Acharya. The film is produced by Hiroo Yash Johar,Karan Johar & Deepak Dhar under the production banner Dharma Productions,LionsGate Entertainment,Endemol India and Fox Star Studios.Music is composed by Ajay-Atul.The first look of the film poster was unveiled on 9 March 2015.The film is scheduled for release on 14 August 2015. The story is about two brothers David Fernandes played by Akshay Kumar and Monty Fernandes played by Sidharth Malhotra.David and Monty are the sons of Gary Fernandes played by Jackie Shroff.David,the elder son of Gary is an ex-fighter who turned as a physics teacher,where as Monty his younger son does not get any good job.Monty is a loner and an alcoholic.He is active in the world of Underground street fighting,but he lacks a winner's attitude. David's wife is Jenny Fernandes played by Jacqueline Fernandez.One day David comes to know about her daughter's(Poopoo) bone weekness that she will die if operation is not done.David gets an idea to make money for her daughter's operation and he will become again a fighter.At the same time even Monty his younger brother is also preparing to become a figher.What happens when they both face each other in the same competition forms the rest of the story. 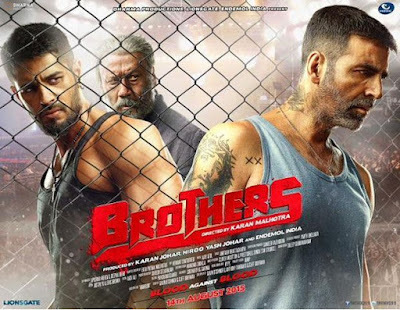 Watch out the official theatrical trailer of Brothers starring Akshay Kumar,Sidharth Malhotra,Jackie Shroff and Jacqueline Fernandez in the main roles.The films trailer was released on 10 June 2015 by Dharma Productions. Listen to the juke box songs of Brothers which are composed by Ajay-Atul.The lyrics are penned by Amitabh Bhattacharya.The juke box consists of 5 songs which are sung by Sonu Nigam,Vishal Dadlani,Neeti Mohan,Shreya Ghoshal,Mohammad Irfan,Chinmayi Sripada.